Scary Monsters magazine #01 - Collector's Edition - The Beginning! 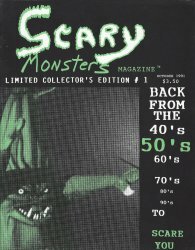 MyMovieMonsters.com > Scary Monsters Magazine > Scary Monsters 1-100 > Scary Monsters magazine #01 - Collector's Edition - The Beginning! This is the premier issue of Scary Monsters, published in October 1991. Each copy is new, uncirculated and picked directly from the printer's shipping carton. All ads, contact information and website addresses appearing in this magazine are no longer valid. Please direct all inquiries to the new publishers at scarymonsters@mymoviemonsters.com.